For other uses, see CTV Building (disambiguation). The CTV Building was the headquarters of Canterbury Television (locally known as CTV) and other companies. Located on the corner of Cashel and Madras Streets in Christchurch Central City, in New Zealand. It became one of the symbols of the February 2011 Christchurch earthquake after 115 people lost their lives when the building collapsed during the disaster; the deaths made up about 60% of the earthquake's total fatalities. The CTV Building was designed and constructed in about 1986. Christchurch City Council gave building consent in September 1986. 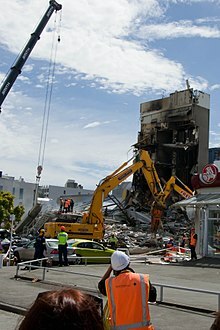 Building codes for earthquake design changed frequently in New Zealand following the 1931 Hawke's Bay earthquake (in 1935, 1965, 1976, 1984 and 1992). A significant change in design philosophy was the change from non-ductile design of a reinforced concrete structure to a ductile approach, where it is expected that building joints yield in design earthquake events, which might make a structure uninhabitable but without it collapsing. A new reinforced concrete standard emphasising ductility came into effect in New Zealand in 1982. Stefano Pampanin, an Associate Professor at the University of Canterbury who teaches in structural and seismic design, described the non-ductile philosophy as "an obsolete design based on the levels of knowledge and code provisions that existed before the mid-1980s". The structural design engineer was Alan Reay Consultants (named after the company's owner) and the architect was Alun Wilke Associates Architects, both of which are firms based in Christchurch. In September 2012 it was discovered the man who supervised the building's construction had faked his engineering degree. Gerald Shirtcliff had stolen the identity of a retired engineer based in the UK, William Fisher. The pair had been friends in the 1960s, and Shirtcliff stole Fisher's degree by adopting his name. It was later discovered Shirtcliff's father had done most of the work on his masters in highway engineering. The CTV Building was inspected by engineers after the 4 September 2010 Canterbury earthquake and after the 26 December 2010 4.9 magnitude aftershock. On both occasions, the building was declared safe, having suffered only superficial damage. The building collapsed in the 22 February 2011 earthquake and, due to its high death toll of over 100 people, has become one of the symbols of the earthquake. The building was owned since 1991 by Madras Equities, a company owned by shareholders Russell Warren Ibbotson and Lionel Walter Hunter. Hunter lost a friend in the building and told a reporter if he had known that there was anything wrong with the building, "I would have pushed it over myself." The building's main tenant was Canterbury Television and the company held the naming rights. CTV occupied the ground and first floors, Levels 1 & 2. The second floor, Level 3, was not tenanted during the quake. King's Education, an English as a second language school occupied the third floor, Level 4. The Clinic, a medical clinic, was on the fourth floor, Level 5; and the not-for-profit agency Relationship Services was on the fifth floor, Level 6. A nursing school was also located in the building. The building collapsed in the February 2011 Christchurch earthquake, with only the north shear wall that included the lift shaft left still standing. One survivor was quoted as running out of the ground floor during the shaking. When she had reached the other side of the 14 meter wide road, she looked back and "the building was down." Within minutes, a fire broke out. Most of the deaths were caused by the collapse, but it is assumed that some of the victims suffered fatal burns, and some may have even drowned during the efforts of putting the fire out. King's Education was an ESL school that was located on Level 4 of the CTV building. There were an estimated 87 regular students and 27 visiting students in the building at the time of the earthquake, as well as 17 staff members. Some people had already left the building for lunch when the earthquake struck. The loss of hard copy and server records in the earthquake complicated the school's attempts to contact students and next-of-kin; as a last resort, the school decided to post best-known student and staff status and location on the Internet in spite of privacy issues, in an effort to update friends and relatives and to find students who were not accounted for but who were not in the building at the time of its collapse. The disaster received particularly wide coverage in Japan due to 27 of the victims being Japanese. The building collapse killed 115 persons, consisting of 16 Canterbury Television employees on Levels 1 & 2; 79 King's Education staff (4), teachers (5) and foreign students (70) on Level 4; 19 medical centre staff (13), patients (5) and one patient's friend on Level 5; and an Administrator for Relationship Services on Level 6. The bodies of four victims in the CTV building could not be identified because the high temperature of the building fire had destroyed any traces of DNA. The inquest into the CTV building deaths was adjourned in September 2011 and resumed in October 2012. This second inquest, continuing until December 2012, paid particular attention to six CTV building victims who were alive for some time but could not be rescued. The follow-up report was completed and released in March 2014 by Coroner Gordon Matenga. Eight victims were identified as making cell phone contact following the building collapse, apparently all affiliated with the King’s Education program located on Level 4. Two of the eight died from their injuries early on, but six of them were identified as being injured but alive until the early hours of the next day, when uncontrollable fire, smoke, and further collapse resulted in their deaths. The report is mainly for establishing time and cause of death but is 56 pages long and it includes detailed observations and conclusions from rescuers, administrators, survivors, and friends and family members of several victims, and it includes several recommendations for additional training. Dozens of people survived the collapse of the building. At least 18 staff and patients from Relationship Services on the top level, Level 6, survived the building collapse. Nina Bishop, a Relationship Services administrator, was the only fatality on that level. CTV receptionist Maryanne Jackson was the only person to survive from the ground floor; she did so by running out of the building as the quake struck. In May 2011 the last remnants of the building, the lift shaft, were demolished. It was announced in July 2013 that the Crown had bought the land for the Eastern Frame, a new park proposed on the east side of the central city. The CTV site was under consideration for a Christchurch earthquake memorial, but a final decision had not been made. The Royal Commission of Inquiry heard evidence into why the CTV Building collapsed during the 2011 earthquake from 25 June 2012, and was scheduled to run for eight weeks. Witnesses before the Commission debated whether the building was code-compliant when it was built, and whether the engineers designing and approving the building had adequate experience. Consulting firm head Alan Reay stated that the building did not meet his own standards, and he thought the engineer he employed for the design, David Harding, had adequate experience. Harding had not designed buildings of more than two floors before. He said he relied on Reay for guidance, and that the developers wanted a minimum-cost design to (just) meet the code; no extra reinforcing was to be added or you “got your hand smacked”. Witness Arthur O’Leary, a structural engineer, said that a “critical eye” should have been cast over the building design. The “pioneering” structural design could have been beyond the experience of council staff to evaluate, though the “pioneering” design meant that non-compliant elements in the building columns were not obvious. Panel member Barry Davidson also disagreed with an “opportunistic and legalistic” interpretation of the code that found they were compliant. The commission's findings were released on 10 December 2012. The report found the building's design was deficient and should not have been approved. The building's engineer, David Harding, of Alan Reay Consultants Ltd, was found to have no experience in designing multi-storey buildings and was "working beyond his competence." His supervisor, Alan Reay, left Harding unsupervised then pressured city officials to approve the building design even though several members had reservations about the design. ^ a b "Christchurch Earthquake – an overview" (PDF). Wellington: Institution of Professional Engineers New Zealand. 4 March 2011. Archived from the original (PDF) on 9 April 2011. Retrieved 13 April 2011. ^ a b "CTV Building hearing: Architectural and structural drawings of the office building at 249 Madras Street". Canterbury.royalcommission.govt.nz. Retrieved 12 January 2013. ^ "CTV building 'collapsed in seconds'". 3 News. 25 June 2012. Retrieved 15 July 2012. ^ a b Barton, Chris (17 December 2011). "Christchurch: Inside the red zone". The New Zealand Herald. Retrieved 18 December 2011. ^ Schwartz, Dominique (26 July 2011). "The anguish, the anger". ABC News. Retrieved 18 December 2011. ^ McSaveney, Eileen (2 March 2009). "Building for earthquake resistance". Te Ara – the Encyclopedia of New Zealand. Retrieved 13 April 2011. ^ "Stefano Pampanin". University of Canterbury. Retrieved 13 April 2011. ^ a b c d e f g Matthews, Philip (9 April 2011). "Death Zone". The Press. pp. C1, C3–C5. Retrieved 11 April 2011. ^ "Sunday August 21: CTV; Sally Nielsen; Paul the angel". TVNZ Sunday. 21 August 2011. Retrieved 24 August 2011. ^ Moreau, Krissy (15 September 2012). "CTV building engineer faked degree". 3 News NZ. ^ "Built On Lies". 60 Minutes NZ. 28 October 2012. ^ "No case against CTV fraudster". 3 News NZ. 20 May 2013. ^ "Violent aftershocks hit Christchurch". The Press. 26 December 2010. Retrieved 13 April 2011. ^ a b Callick, Rowan (26 February 2011). "CTV building had been given all-clear after previous quakes". The Australian. Retrieved 13 April 2011. ^ "Owners: NZ's CTV building was structurally sound". CBS News. 28 February 2011. Archived from the original on 29 April 2011. Retrieved 13 April 2011. ^ Chapman, Kate (2 March 2011). "CTV building's owners welcome collapse inquiry". The Press. Retrieved 12 April 2011. ^ a b "Hearing told of survival after CTV plunge". The Timaru Herald. Retrieved 15 July 2012. ^ Wright, Michael (9 July 2012). "Fears over CTV may have been 'nerves'". Stuff. Retrieved 15 July 2012. ^ King's Education – Christchurch New Zealand Archived 27 February 2011 at the Wayback Machine. Kingseducation.co.nz. Retrieved on 25 April 2011. ^ "Evidence painful for families of CTV dead". Stuff. 1 July 2012. Retrieved 15 July 2012. ^ "Work to identify earthquake victims completed". New Zealand Police. 8 September 2011. Retrieved 16 August 2012. ^ "CTV deaths inquest to start again". Stuff. 16 August 2012. Retrieved 16 August 2012. ^ "Christchurch Earthquake CTV Building Inquiry – Inquiry into the deaths of Dr Tamara Cvetanova and others". Coronial Services of New Zealand. Retrieved 6 December 2015. ^ Matenga, Gordon (27 March 2014). "Inquiry into the deaths of Dr Tamara Cvetanova and others" (PDF). Coroners Court at Christchurch, Coronial Services of New Zealand. Retrieved 6 December 2015. ^ ""This is the end" – survivors speak". Christchurch Press. 17 February 2012. Retrieved 22 February 2014. ^ "Quake CTV survivor:'I see things so differently'". New Zealand Herald. 22 August 2011. Retrieved 22 February 2014. ^ "'Get in touch' quake survivor pleads to rescuers". TVNZ. 5 March 2011. Retrieved 22 February 2014. ^ "Quake spurs survivor to set up firm". Christchurch Press. 1 November 2011. Retrieved 22 February 2014. ^ "Quake – a year on: Mum recalls 'miracle' of surviving five-floor fall". New Zealand Herald. 22 February 2012. Retrieved 22 February 2014. ^ Bown, Giles (12 May 2011). "CTV building coming down". Stuff. Retrieved 12 May 2011. ^ Mathewson, Nicole (17 July 2013). "Government buys CTV site". The Press. Retrieved 17 July 2013. ^ "CTV Building Hearing – Overview". Canterbury Earthquakes Royal Commission. Retrieved 15 July 2012. ^ Wright, Matthew (15 August 2012). "CTV engineer 'was experienced'". Stuff. Retrieved 16 August 2011. ^ Dally, Joelle (30 July 2012). "CTV engineer inexperienced on high rises". Stuff. Retrieved 16 August 2012. ^ Greenhill, Marc (13 August 2012). "CTV needed a critical eye – engineer". Stuff. Retrieved 16 August 2012. ^ Greenhill, Marc (14 August 2012). "Design may have been beyond council". Stuff. Retrieved 16 August 2012. Wikimedia Commons has media related to Canterbury Television building. This page was last edited on 16 November 2018, at 05:45 (UTC).